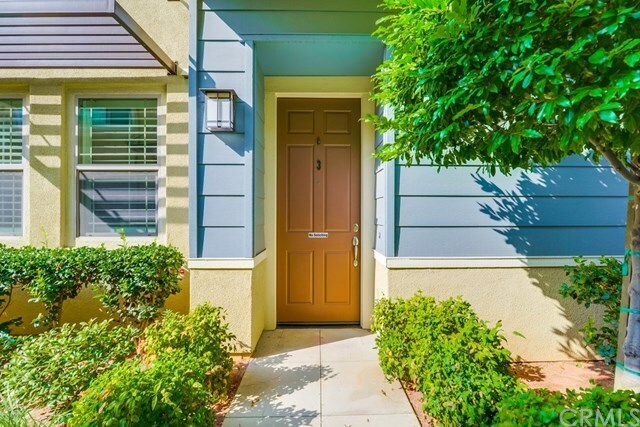 Welcome to the very much desired 12452 Benton Dr Unit #3, a rare find being one of few single story, ground level entry condos in Rancho Cucamonga. Not to mention its conveniently located with shopping, dinning and entertainment just steps away at Victoria Gardens. This Beautiful, well maintained home offers an open floor plan with 1,572 sqft of living space, consisting of 2 spacious bedrooms, 2 full baths, large kitchen, living room, dinning room, laundry room and a grand office. The home boasts modern living with all of its upgrades. High end wood shutters letting in seamless natural sunlight that accentuates the wood flooring that flows throughout the common areas and the travertine flooring in the bathrooms, kitchen and laundry room. In the Kitchen Granite counters compliment warm wood cabinetry and that same warm wood is displayed in the living room and the grand office as luxury built-in cabinetry. Additionally this home has its very own attached 2 car garage and unlike most condos, it also features its very own private fenced yard with a large covered patio, outdoor storage closet and gardening area with auto-sprinklers. This gorgeous community with lush landscaping includes a luxurious club house, large pool, BBQ area, gym, and library. Don't miss out. Call today to make an appointment to view this beautiful home. Directions: From Day Creek: East on Church St, South on Arbor Ln, West on Gatsby Dr, North on Creole Pl, West on Benton Dr, Destination will be on your right.